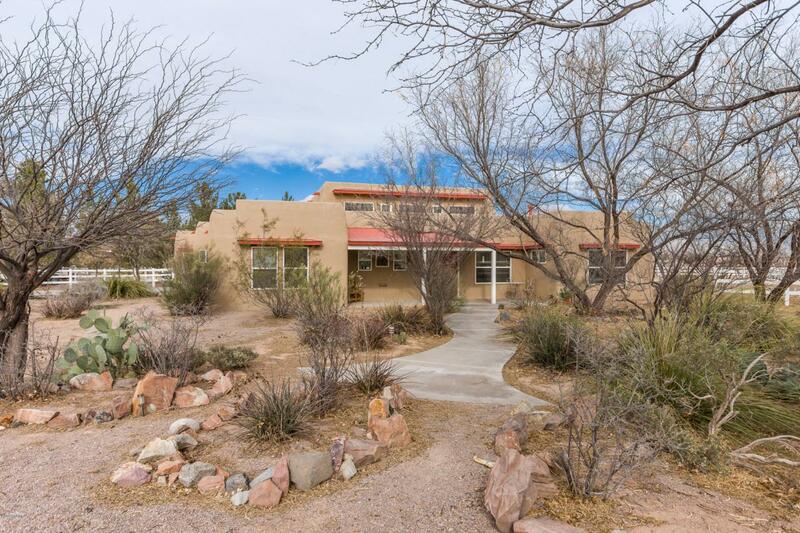 This beautiful custom-built passive solar home sits on 1 acre of former farmland in a secluded 9 home development. An irrigation well supplies water for the garden area & lovely native trees/shrubs throughout the yard. The spacious open living area has 15 ft ceilings with large clerestory windows for natural light & warmth in the winter. The living & dining areas are separated by a designer fireplace. The home has custom cabinetry throughout; the generous sized kitchen has a large island, pantry, & counter space galore. All four bedrooms have sizable walk-in closets and ceiling fans. Master bedroom has door to back patio.Take in views of the orchards from the covered front porch, and of the majestic Organ Mountains while relaxing on the back patio. The home has many energy efficient & sustainable features, including low-e windows, extra insulation, & TPO roof less than 10 years old. Newly painted inside and out. Covenants allow for horses and other livestock - all this and only 10 minutes from town!